Data is driving us towards a future of personalised, dynamic delivery. Mike Richmond from parcel collection service Doddle tells us more. When it comes to online shopping, speed of delivery has traditionally been a key factor in the way shoppers view convenience. But the rate at which retailers are trimming down delivery times — which has quickly gone from next-day to next-hour — is becoming unsustainable. Many are instead now looking at alternative ways of adding convenience, and much of this centres on slotting into shoppers’ daily routines as seamlessly as possible, by offering greater flexibility and choice in where and when their packages are delivered. Doddle is a parcel collection service in the UK that’s been carefully researching and responding to changing customer expectations around delivery. We spoke to Strategic Development Director Mike Richmond to find out more about how perceptions of convenience are changing, and what retailers can do to keep up. How have consumer expectations changed when it comes to delivery? Are shoppers looking for more than just speed? When you look back to the “old” days of catalogue buying, waiting three or four weeks for an order to be delivered was standard. Skip forward to 2017 and next day delivery is the overwhelmingly preferred delivery option of UK shoppers, and Amazon are pushing the boundaries further with things like Prime Now. Interestingly, though, whilst the push has recently been for faster and faster delivery, I think the market’s now settling around a late cut-off next-day delivery product as it’ll be challenging for most retailers and carriers to provide a same-day delivery product in a sustainable way, at a price point which consumers are willing to pay. As to the question of ‘more than just speed’ – we know consumers have come to expect free delivery, particularly over certain basket values, and increasingly they are looking for retailers to offer in-store and third-party click-and-collect offerings. We believe there’ll be over 150m parcels ‘click-and-collected’ this year – pretty amazing volume given click-and-collect didn’t exist a few years ago. How has Doddle adapted and evolved? We came to market three years ago looking to fundamentally change the way consumers collect and return online shopping. We’ve had to continually adapt based on feedback from retailers and consumers. The biggest change has been the move away from our network of dedicated stores. It has allowed us to expand our estate and stretch our ambition. 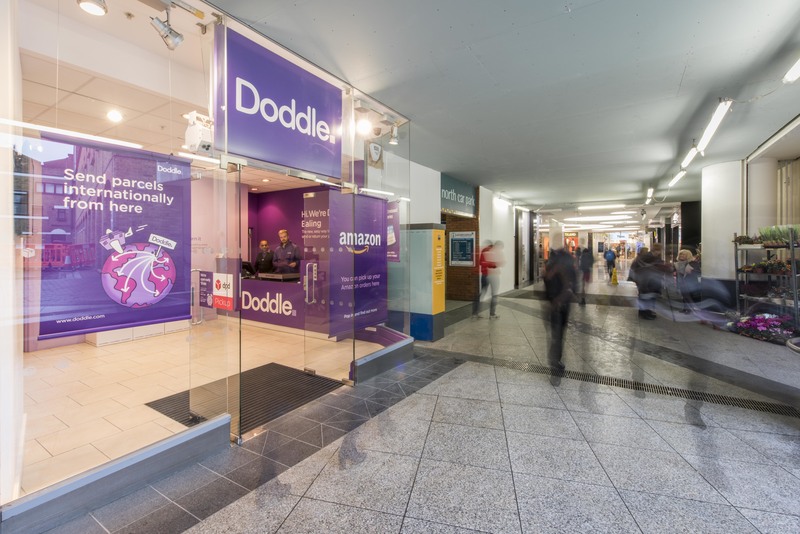 We now offer Doddle services within other retail environments such as supermarkets, department and charity stores, which enables more consumers to access Doddle services. How are organisations making use of data & intelligence to streamline the delivery process? Organisations in the retail logistics sector are getting better at this, with the likes of Amazon and DPD leading the way, but I think there is still a lot of room for improvement across the board. If you think about the number of data points a business could use to personalise delivery options, we use hardly any of them. Instead, on most retail checkouts, consumers are typically served economy and next day delivery options, and services like click-and-collect are seen as innovation. In the future, I believe we’ll see a move towards personalised, dynamically-priced delivery options, based on all the data points available for that consumer (a sort of credit history for online shoppers and their ‘delivery success record’). Information such as historic delivery data for each customer, size and weight of product, preferred delivery speed, carrier capacity and the ability to consolidate that delivery with others via click-and-collect for instance, should be used to support smarter and more sustainable delivery pricing. What are the main pain points customers are coming up against, and how are organisations tackling them? The one issue we hear our customers talking about all the time is information. From tracking information on deliveries to updates on the progress of a return and refund, consumer expectations around information and communication have increased. I think we’ll see more businesses investing in customer care as a driver of customer lifetime value, and increased adoption of new communication channels to match consumers’ day-to-day communication preferences. On the whole, though, I think consumers are well served by most retailers in the UK. The competitiveness of the UK delivery market has pushed prices down for the last decade, to the point where free delivery and returns are the norm in the UK. International retailers and carriers can’t fathom how it’s sustainable – some would argue it’s not. Where do you think the future of delivery lies? I’d love to see retailers and carriers upping their technological capability to offer more dynamic, personalised delivery options. In an economically efficient supply chain, prices should go down where consumers are flexible, delivery is easy, and demand is low — and it should go up when consumer delivery preference is rigid and specific, delivery is hard, and demand is high. We’re a long way from this model at the moment, but as each part of the customer journey becomes more personalised, it stands to reason that delivery should be too. Broader, environmental issues will become a bigger consideration for the sector. For example, I think the impact home delivery has on air pollution and congestion will push the market away from home delivery being the norm as is more often the case in Europe. In Sweden, >80% of deliveries are collected at pick up points, with consumers paying a hefty premium for home delivery. That model would help solve a lot of the UK’s challenges in the delivery sector and also drastically reduce the number of vans we need on our roads every day.